Superga’s Classic Cotu sneaker has been featured on countless style blogs but our readers want to know: do they work well for travel? We put them to the test. 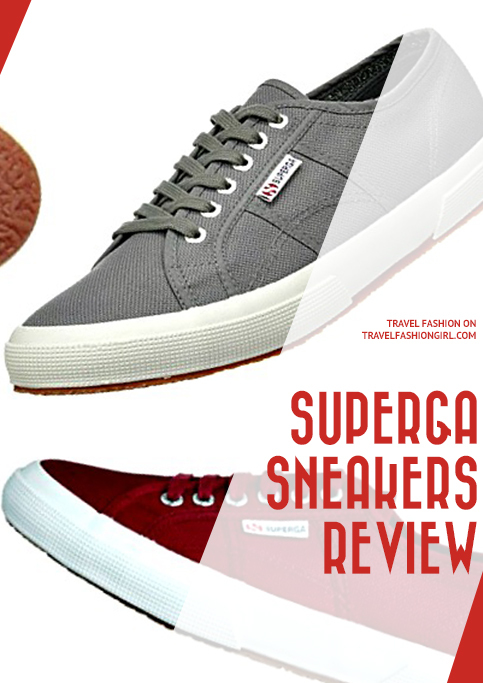 Check out our Superga sneakers review! How do Superga sneakers fit? Are Superga tennis shoes supportive? Are Superga sneakers good for travel? Readers agree Superga Cotu are great! When it comes to Superga vs Converse or Superga vs Vans, we’ll choose Superga every time. This brand looks so good with any outfit, we’ve put together a Superga sneakers review to spread the love about this style footwear brand! Destinations: Anywhere! They work for long days of shopping or sightseeing. Superga is an Italian footwear brand that is best known for its classic 2750 Cotu Classic sneaker shown above. The design is over 100 years old but has been transformed over the years to feature new heights, fabrics, and weather-friendly options, too. The Superga Cotu looks like a traditional sneaker (think Converse or Keds) but for some reason attracts a wider range of women including fashionistas, celebrities, even royalty. In fact, Kate Middleton was spotted wearing a pair at the London Marathon amongst other places. Many years ago, I first saw a girl wearing a black pair of Supergas in Rome paired with a nice black romper. I couldn’t believe how stylish they looked with her chic outfit. The Superga Cotu sneaker seems more polished and put together than a traditional sneaker even though it looks so similar. Somehow they’re just different. Perhaps Supergas are the shoes you wear if you don’t normally wear sneakers? I should note that these sneakers come in a variety of styles, too. There are Superga slip on sneakers, Superga platform sneakers, and Superga white sneakers and they easy to pair with any outfit! A day out in England can mean experiencing four seasons in one day, so layering is a must! Love this versatile leather jacket that I can throw over just about anything, while a classic striped sweater and metallic accessories add a stylish flare. Link in bio to shop these products, or check them all out here! ➡️ http://liketk.it/2rYsE #liketkit @liketoknow.it What are your must have layering pierces? Share in the comments below! I normally wear a size 7 US and bought size 37 1/2. When it comes to Superga sizing, the shoe fits the exact length of my foot. I do have a narrow foot and wear the laces tied very tight to have a secure, snug fit. However, overall the shoe is true to size based on the Superga size chart shown above. I find Supergas incredibly comfortable! They have become a staple in my travel wardrobe. They have a soft foot bed, which makes them easy to wear everyday. been incredibly happy with them after using them almost daily for over six months! While Superga Cotu sneakers don’t offer built-in arch support, many travelers use either a removable arch insole or gel insole to adjust for their own level of comfort. If you require arch support for your Superga sneakers, you can also try our list of the best travel shoes for arch support! As a traveler that’s always looking to pack light, their weight instantly put me off. In fact, this was the only complaint our readers had about these shoes when they weighed in with their Superga sneakers review. They all said they were cute but they were heavy. The weight almost stopped me from traveling with them, and I’m so glad I didn’t. I wanted to find out why so many women are in love with these shoes. I wore them on the plane to and from my destination instead of packing them inside my suitcase. Because of this, their weight was no longer an issue for me as a traveler. As I’ve already mentioned, these shoes are stylish and well-loved by many. If you’re happy with light support and comfortable yet casual chic shoes, they’re are a good option for travel! However, if you need arch support, choose from these shoes instead! Are you looking for what to wear in Paris? Read our guide! I’m so glad I gave these shoes a shot and was able to share my Superga sneakers review! I ended up wearing them all summer in England for cool days with minimal rain. They are ideal shoes for mild weather travels, cool summers, and light rain. They still hold up, despite my wearing them all over town just about every day. They’re ultra-stylish and seem to go well with all my clothing. They’re also celebrity and blogger approved. For some reason, these sneakers have been the only exception to this rule. I even tried fashionable leather sneakers, but they still didn’t feel right. My classic Supergas in grey have somehow transcended my dislike of sneakers (or athletic shoes). You can buy Superga sneakers directly on their website, Nordstrom, or Zappos. I bought mine on Amazon UK although they’re also available on Amazon US. To encapsulate my Superga sneakers review – as someone that does not wear sneakers or any type of athletic shoe, I have seriously fallen in love with these shoes!!! They’ve traveled practically everywhere with me the past year and I even took them to the Galapagos. They’ve also become my go-to summer shoe in England and a no-brainer option for days or trips where I’ll be encountering a variety of weather including light rain. They are 100% TFG Approved! 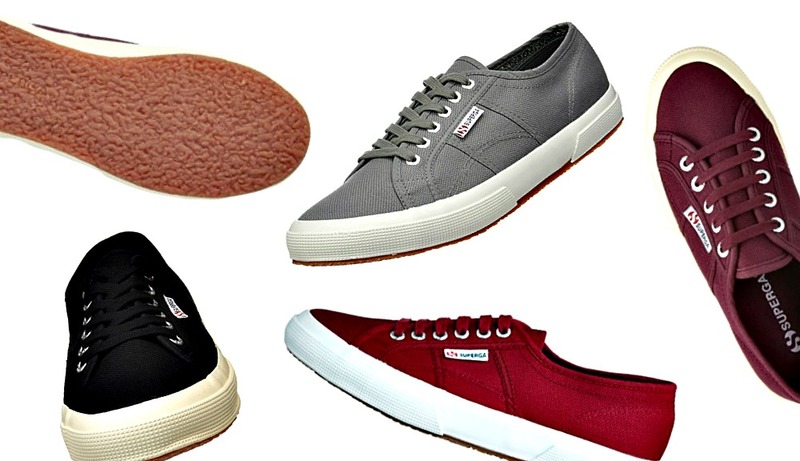 If you are looking for an easy to wear, neutral shoe that you can use in a variety of settings and weather (and you don’t need arch support), the Superga Cotu Classic is a must! The truth is, I’m not a sneakers kind of a girl. I never have been and, despite athleisure being so popular the past few years, this style is just not for me. Wearing any type of athletic shoe, whether it’s a cute pair of slip ons or trendy Nikes, can look ultra-stylish on so many women but there are only two places I’ll wear sneakers: to the gym and on a mountain. Never in the city. Never to the grocery store. Never! I don’t know why, but athletic shoes are just not for me. It’s a shame, too, because I’ve tried to like them. I really have. There are so many cute styles of athletic shoes out there, especially as designers have embraced the popularity of athleisure. I love how stylish other women look with their sleek outfits paired ever so casually with a sneaker. Fortunately, as a traveler, not wearing sneakers has never been an issue for me. In the heat, I wear sandals. In the cold, I wear boots. Just as I would have done at home in Los Angeles. If I wouldn’t wear athletic shoes at home, why would I do so while traveling? These sneakers changed the way I thought about wearing athletic shoes. No longer was I adverse to pairing these cute shoes with everything from casual leggings to more formal travel wear. Determining how to pack sneakers for travel can be difficult, especially if you’re trying to pack light. To make it easier, start by choosing a container such as a shoe bag or a packing cube then pack according to your type of luggage. Whether you have a front loading or top loading backpack, it is important to put your shoes in first, at the bottom. If you’re planning to pack shoes in a rolling carry-on, remember that it’s stands sideways so it is important to note how it functions when it is upright. Most often, your shoes will need to be packed close to the wheels, so that the luggage maintains its balance in transit. To store, use washable shoe bags, gallon size Ziploc bags, or plastic shower caps to keep your belongings separate from your shoes. Do you have these shoes? Share your Superga sneakers review in the comments! Hope you enjoyed this Superga sneakers review. Please share it with your friends on Facebook, Twitter and Pinterest. Thanks for reading! Are yours a slip-on style? I’m trying to understand how they are laced like that in your close up pic. Do you wear these with socks or without? If with, what kind/brand of socks? Hi! Do you know what insole brand would fit in the Superga Cotu? Hi Iris, thanks for your question! We’ll share your question here so the author of the article can reply. You do realize these are basically old school Vans with a hideous Keds some, right? You incorporated them well! You should try Chucks! I’ve been lucky enough to travel to a lot of placed and, like you, used to reject sneakers/trainers/athletic shoes, feeling they made me look like a tourist, which seemed both tacky and unsafe. However, in the past 3-4 years, I’ve noted that EVYERONE is wearing sneakers and it’s possible to find what I call “city sneakers” that look good. New Balance and Adidas appear wildly popular among stylish people in major European cities, and if you have the budget, similar, but far more expensive styles are available from top fashion houses. I came back from an Adriatic coast trip last night and am thankful that I decided to bring well cushioned, well-tractioned shoes. Croatia’s top sites often include stairs and uneven paths that are ancient, stone, sloped downward from years of use, and probably really slick in the rain. I have flats by Ecco, Tsubo, etc., but I would have felt less sure about making it up or down some of the more challenging walls, staircases, etc., and it would have been a bummer to miss the views. I’d say to get a light colored city sneaker for warm trips and a navy, black or burgundy for shoulder season or cool weather trips, spray them with fabric protectant to make them easier to clean and keep you dryer in case of bad weather. Also, FYI, due to the great views and really uneven roads/stairs, I frequently stubbed my toes in Croatia and on a prior trip in Portugal (similarly steep hills, but tile sidewalks). Sandals would have been a poor choice for the terrain. Great for museum days or dining, but not for roaming all over the city. My Supergas saved me in Rome and Florence! We walked 10 to 12 miles a day over 2 weeks on those beautiful but grueling black cobblestones. I alternated between my black Naot Pixie sandals, Sixty-seven D’Orsay pointed toe flats and my black ‘Gas. I did bring a fourth shoe, a dressy Steve Madden block heel sandal for dinner at a Michelin star restaurant in Tuscany. All were just what I needed. Great post! I’ve been looking for the perfect “unicorn” sneaker for travel! Are yours “gray” or “sage gray”? Thank you!